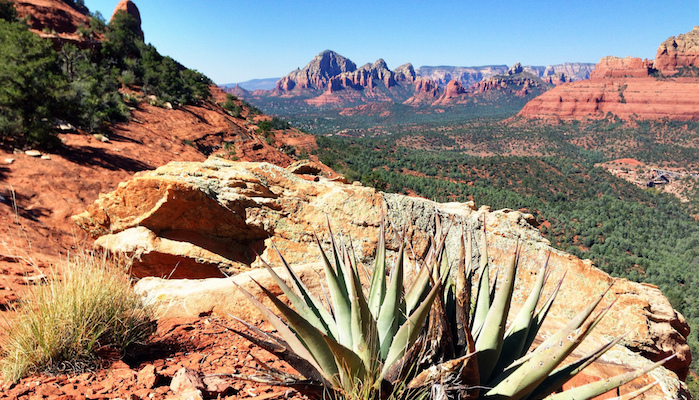 One surefire way to beat the repercussions of a night out in the town is an early morning run on the Hangover Trail, a fairly technical trail with some of the best views in Sedona. This trail is often combined with the Cow Pies Trail and the Munds Wagon Trail for an 8 mile loop. Most runners start from the Cow Pies Trailhead off Schnebly Hill Road. Getting there is a bit of a rocky road, but the trail is one of the flatter and easier cross country routes in Sedona. The “cow pies” are actually rock formations, recognizable as the backdrop of numerous Hollywood films. Head east towards them on the Munds Wagon Trail. You’ll pass the Hangover Trail after about 1.5 miles, but don’t turn yet — the Hangover Trail is intended as a one way trail. Turn onto it at the second left around 2.5 miles. You’ll make your way up the beautiful Mitten Ridge for a couple of miles before descending back to the Munds Wagon Trail and returning in a lollipop formation. You can make this a shorter run by using Schnebly Hill Rd. Note: This is a hilly, challenging run.